Prepping the cucumber: Cut the cucumber into 2-3 inch matchsticks (depending on the size of your rolls). Prepping the shrimp: Remove and discard the head of the shrimp if it's still attached. 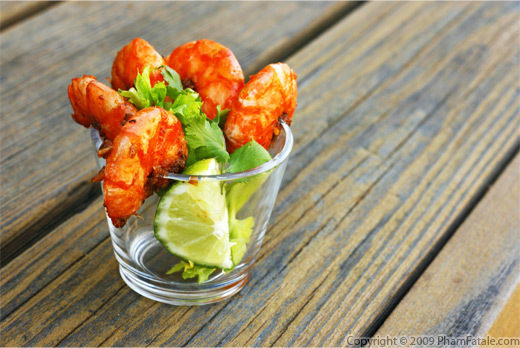 Cooking the shrimp: Combine 1 quart water, sugar, vinegar, red chili powder and the caramelized onions in a small saucepan. Bring to a boil. Dip the shrimp into the liquid (once it's changed colors) for about 2-3 minutes. Add salt. Check doneness of the shrimp; it should be firm, white with shades of orange. Drain the cooked shrimp. Once it's cool enough to handle, carefully shell (make sure to remove the tip of the tail as well, this part is very delicate) and de-vein the black part of the shrimp using a sharp hook-like paring knife, then halve lengthwise. For the bean sprouts and herbs: Wash the bean sprouts and drain through a salad spinner. Repeat the same procedure with the lettuce, mint and basil. Remove as much liquid as possible. Fill a saucepan with water. Bring the water to a boil. Let cool a bit. Transfer to a large bowl. It's important that the water isn't too hot. Fold a paper in 8 to create a thick sponge. Dip it in the hot water and brush both sides of the tapioca sheet. Remember, tapioca sheets are a lot more delicate than rice paper; you don't want too much excess water. Place on a flat surface. Wait about 1 or 2 minutes. The tapioca sheet should be soft but not too wet. I usually dip 4 tapioca sheets at a time, then start wrapping. 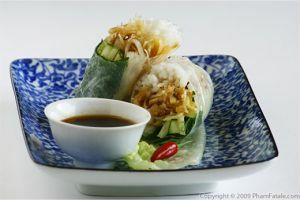 Using the softened tapioca disk as the wrapper, place a piece of lettuce, bean sprouts, mint, basil, rice noodles and 2-3 cucumber "matchsticks". 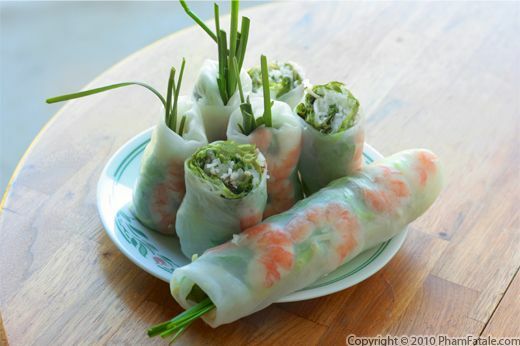 Top with bean sprouts and 4 halved shrimp, so they're still visible once the rolls are wrapped. 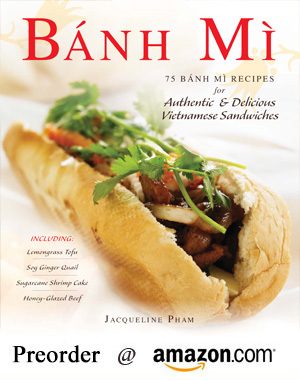 The finishing touch is 2 long stems of hẹ, letting the edd extend out one side of the roll. Everything should be about 1-½ inches from the bottom edge so the roll doesn't burst when it's wrapped (don't over-stuff the rolls!). Carefully fold each side flap and roll away from you. If the tapioca sheet is moistened properly, it should easily stick and roll. Tuck all the mixture into the wrapper, forming a cigar. Repeat until all the ingredients are used. Dip the roll in the peanut and hoisin sauce and enjoy with pickled daikon, carrots and papaya on the side. You could use just about anything as the filling in the wraps. 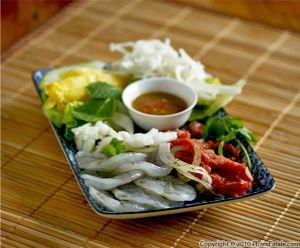 Thinly sliced grilled meat, more seafood , Chinese cabbage or even the pickled vegetables are also common ingredients. Hẹ are Vietnamese garlic chives which make the dish authentic. If you don't like the taste, just omit the herb. All the ingredients listed above can be found in any Asian stores. 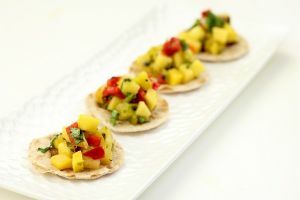 I didn't have any on hand but I usually like to add shredded green mango for texture and added sweetness, which pairs well with the shrimp. Adding caramelized onions into the boiling liquid helps reduce the fishy flavor of the shrimp. Vietnamese mint has a very different flavor from regular mint. It also has darker vein markings on the leaves. 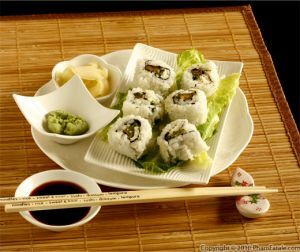 You can use any kind of lettuce such as iceberg or romaine lettuce. Just remove the large center vein prior to rolling. For the rice vermicelli noodles, just boil the noodles as you would regular pasta. Drain thoroughly. Let cool completely. 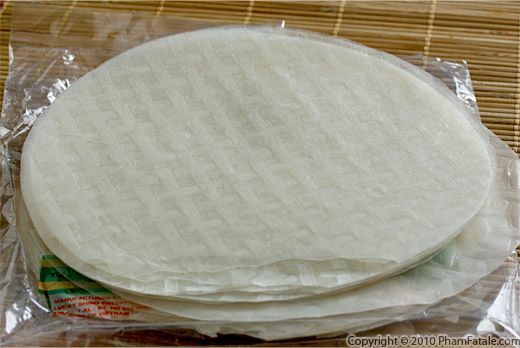 Bánh tráng mỏng are dried tapioca starch paper sheets. If you don't have any, you could use rice papers but I find them a lot thicker. My favorite brand is Ba Co Gai (Three Ladies). To save time, I often have already-caramelized onions on hand in the freezer. 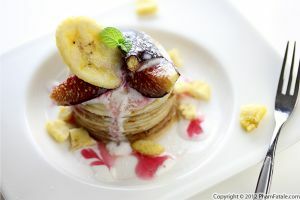 I suggest making them in advance in large batches. Just place about 1 tablespoon of tightly packed fried onions per slot in an ice-cube tray and freeze them. Transfer the ice-cubes into sealable plastic bags and place back in the freezer. I think it's the best way to keep the same flavor without getting freezer burn. I store them exactly the same as I would extra pesto or papaya (for marinating meat).